The MTV Video Music Awards are one pop music's highlights of the year! The award ceremonies are never a dull affair, with jaw dropping live performances and many a controversial moment. As the 32nd MTV Video Music Awards approaches, we thought we would give you a run down of the good, the bad and the ugly moments of the last 10 years that shocked, inspired and changed the world of music. What happens when you put an attractive Baywatch star and her two ex-husbands in the same awards show? Well in 2007 we found out, when an award presentation by Pamela Anderson led to Kid Rock walking up to Tommy Lee’s table and slapping him in the face. A short-lived bout of fisticuffs ensued before the two rockstars were broken up by security and kicked out. 2009- How Kanye Be So Rude? Probably one of the most memorable MTV moments of the last 10 years has to be the Kanye West/Taylor Swift incident. During Taylor Swift’s acceptance speech for ‘Best music Video’, Kanye West proceeded to jump on stage, steal Swift's microphone and announce to the audience that Beyonce had one of the best videos of all time. The result was a perplexed looking Swift and a room full of boos directed at West. Later however when Beyonce won an award, she invited Taylor Swift to get back on stage to finish her acceptance speech. President Obama later commented on the stunt, calling Kanye West a “Jackass”. Lady Gaga left some of her fans feeling a bit raw after she took to the stage adorned in a dress made completely out of meat. This was Lady Gaga's 3rd award of the night, which was presented by Cher. Gaga joked “I never thought I’d be asking Cher to hold my meat purse”. 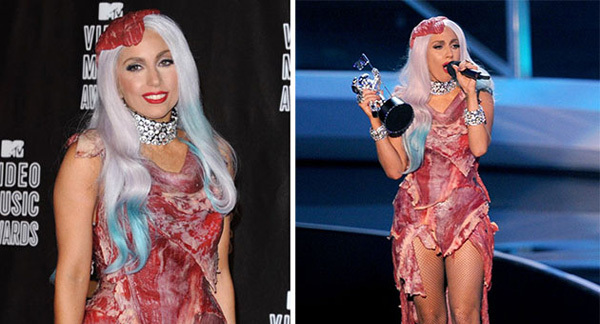 The meat dress as it is commonly referred to, was condemned by animal rights groups, however it was named top fashion statement of 2010 by Time Magazine. The dress is now on display in the Rock and Roll Hall of Fame after being preserved to a type of beef jerky. It’s reported she wore the dress to voice her disapproval of the US army’s treatment of gay soldiers. 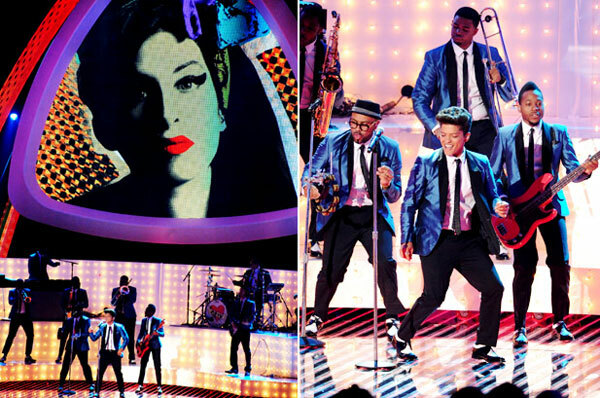 Not so much of a shocker but a great VMA moment when Bruno Mars paid a touching tribute to Amy Winehouse, who had sadly passed away earlier that year. Mars did it in the best way possible, performing an uplifting rendition of Winehouse’s hit ‘Valerie’, wowing everyone with his incredible live band and their slick dance moves. This performance got the whole star studded audience singing and dancing along, a very fitting tribute to such a talented singer and performer, RIP Amy Winehouse. Who could forget the year Miley Cyrus proved to the world that Hannah Montana was now history. Her provocative performance that started with cuddly teddy bears, but finished with Miss Cyrus stripped down in her undies twerking into the groin of Robin Thicke, whilst using a huge foam finger in a very suggestive manner, left audiences stunned. Miley is reported to of said prior to the show that “You’re always gonna make people talk, you might as well make them talk for for like two weeks, rather than two seconds” and she did just that, with Miley breaking the record for most tweets per minute ever! Whether you loved it or hated it, the stunt paid off for Miley, as she was top of the Billboards with wrecking ball just under two weeks later. Lets hope that this years MTV Video Music Awards is as entertaining as past years, you can follow our twitter account @matchboxmusic or alternatively check out our facebook page www.facebook.com/matchboxmusicuk to be kept up to date with all the action! So this week saw the return of one of the most recognized UK music award ceremonies, The BRIT Awards. Now in its 25th year, the BRIT’s has earnt a reputation of being one of the most eagerly anticipated musical events of the year. Here is our round up of the night’s performances and the award winners. How to make a promo video! Interested in getting a video shot for your function band or looking to update your profile? Read ahead for some great advice from video guru Dan Baxter! It is a natural progression when learning an instrument to want to perform with other people. Whether you want to join a local band for fun or to play for the next up and coming music act, you will very likely come across the need to audition. If you have never auditioned before it can be confusing experience, so we have put together a help guide to put you in the right direction.